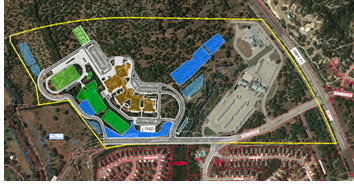 ​​​ ​AUSTIN – The third middle school in Lake Travis ISD has broken ground at 16101 W. Hwy. 71 at Vail Divide. The 240,000-sf campus will accommodate 1,200 students in two-story, grade-level houses nestled into the hillside with Hill Country views. The $76.2 million facility will feature outdoor science and art areas, an outdoor gathering space, abundant natural light and multipurpose breakout areas that allow for flexibility and collaboration.